You’re damn right I’m speaking out loud. 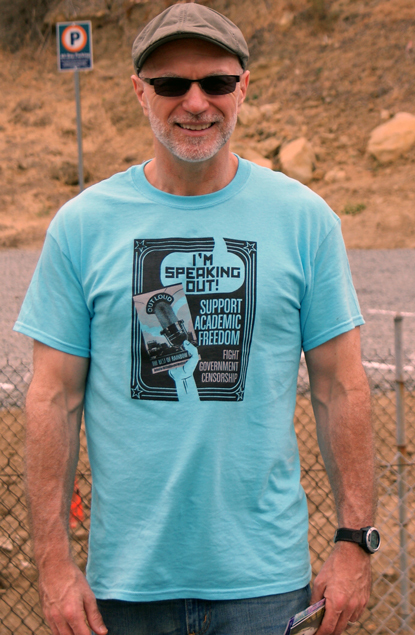 It took some time, but I got my Writers Speaking Out Loud t-shirt, and decided to wear it to my day of art festival hopping in Laguna Beach , California over the July 4th holiday. My understanding is that the Tea Party backed wing of South Carolina’s Republican party offered a so-called compromise to the state’s higher education funding debacle. In case you’re not aware, ultra-conservatives in the legislature were outraged that the College of Charleston and the University of South Carolina-Upstate included two gay and lesbian themed titles on their required reading lists. These lawmakers were so outraged that they pulled a significant amount of funding from the budgets of the two colleges. Their attempt to level government sponsored censorship on these two institutions of higher learning was appropriately met with even more outrage by sensible members of the human race. The GOP-run legislature balked at first and tried to turn a blind-homophobic eye to the protests, but pressure mounted so they decided to put funding back in the budget with a caveat. The two colleges are required to teach documents about American ideals, including, but not limited to the Constitution. I’m guessing in their pea-sized brains they saw this as alternate teachings that would thwart the homosexual agenda. Calling this a compromise, our Tea Party backed governor Nikki Haley signed the legislation. This is not a compromise. It is still censorship because they are forcing the colleges to spend funding on a curriculum that is meant to counterbalance what they deem as un-American ideals and even worse, it paints the homosexual lifestyle as something that is not protected by the Constitution. Nothing could be further from the truth. I grow increasingly weary of the notion that religious ideals trump individual freedoms in this country. I try to steer away from politics on this blog as much as possible, but I fear the need for me to be more politically active is becoming increasingly more necessary. I don’t have much of a voice, but I feel a calling to lend what I do have to the principled protests over the religious extremists’ creep of influence into our lives. This entry was posted in Misc and tagged government censorship. Bookmark the permalink.